So you want to make a crystal based set of terrain, but don’t know where to start? The easiest way to get going is with ready made crystals. The most common of these are decorative ones used to hold flower arrangements, or to add some sparkle to an aquarium. They are usually sold in small bags in the floral decorating section of craft stores, or in pet stores. They come in an assortment of colors, or can be easily painted using a wash of your choice. The second source for ready made crystals is plastic ice. There is a surprising number of companies making plastic ice (mostly for photography or retail display purposes). You will most likely have to purchase these items online. This example picture was taken on top of a mirror in order to get the maximum amount of reflected light to illuminate the crystals. The top four are Tamiya clear acrylic colors straight from the bottle. The lighter green one was painted with a mixture of food coloring and Future floor polish. The clear one is unpainted and only included for comparison purposes. 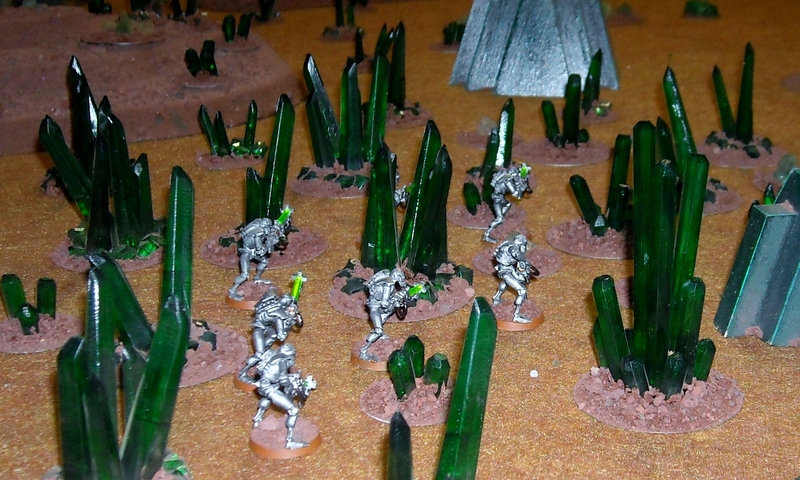 All of the crystals (except the unpainted example) were painted in one solid color. The highlights and shadows are real light effects that move as your perspective or the light source changes. Because of the natural light gathering properties of the clear plastic these are some of the easiest things to paint you will ever find. If you aren’t familiar with using Future to paint with then please visit SwannysModels for an excellent tutorial on using it. Generally speaking the more light you can get into a crystal the better it will look. For this reason we like to base crystals on reflective materials. These roofing washers are the best material we have found for this purpose since they are very cheap and usually have one or more shiny sides. They can usually be found in hardware stores in the nail section. The ice crystals that we used are all made by a company called APM Corporation. They specialize in making plastic ice items, so they are a great source for stuff like this. They can be found at PlasticIceCubes.com (please read our update below). We have gotten a report from somebody who ordered from APM Corporation that their phone has been disconnected, they aren’t responding to emails, and that they are no longer filling orders. It had been several years since we ordered from them, so it was a surprise to us. We didn’t have any problems when we did order from them, however considering this new information it may be wise to make your purchases through another company. These crystals were made using #LC003, #SC004, (from APM) and floral crystals. They were glued down using an epoxy glue. These were made using the #LR001 large plastic ice rock (from APM). They come with the air bubbles cast into them which makes for a nice variation in the crystals. I never would have thought of it either, but it becomes very obvious when you start flocking the base and reducing the reflective surface. We started using the washers because they were inexpensive. The reflective part was just a happy coincidence. It’s always the most obvious things that never occur to me.Good tutorial and good idea. I’m glad you liked it! 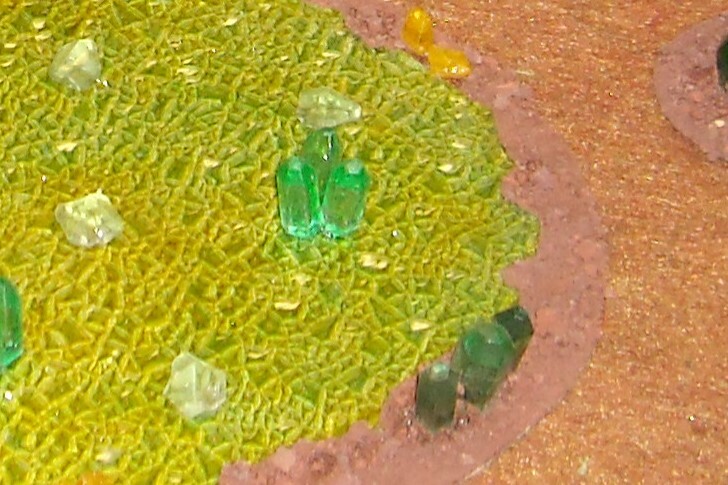 This picture shows just how obvious it is, since the two clusters of green crystals are both painted the exact same color. Having a reflector under just one of the clusters radically altered its appearance! That sounds like a lot of fun. I was thinking that if you use a piece of Plexi Glass as the base then you could probably get away with only using one LED to light up the entire hillside of crystals. Just make sure to paint all of the Plexi Glass that won’t be showing silver before you cover it in flock and make it look like the hill side.